It’s been a while since I bought my Canon EOS 60D and I have been striving to use it effectively from the time it arrived. I feel I must not waste it though on average shots (something that I am sure can not be avoided in the future) so I somehow want to prepare my shots in advance. I previously owned a different class camera (a 12 Mpixel Canon EOS 450D) and whenever I felt pressure from daily issues of life and work, I took it with me and disappeared for a few hours. This is what I plan to do in a few days, time and work permitted, since I also want to discover the new limits of my 18 Mpixel camera in combination with the high ISO value I can use (apparently up to 1600). Yesterday I felt more than usual that I needed to try my camera, so I used one of my favorite “plan your shoot” programs named “The photographer’s Ephemeris” to see when the almost full moon would rise and from what location relatively to my house. The photographer’s Ephemeris is available for desktop computers (you need to download Adobe Air first), android mobiles and Apple iOS (iPad/iPhone/iPod Touch). 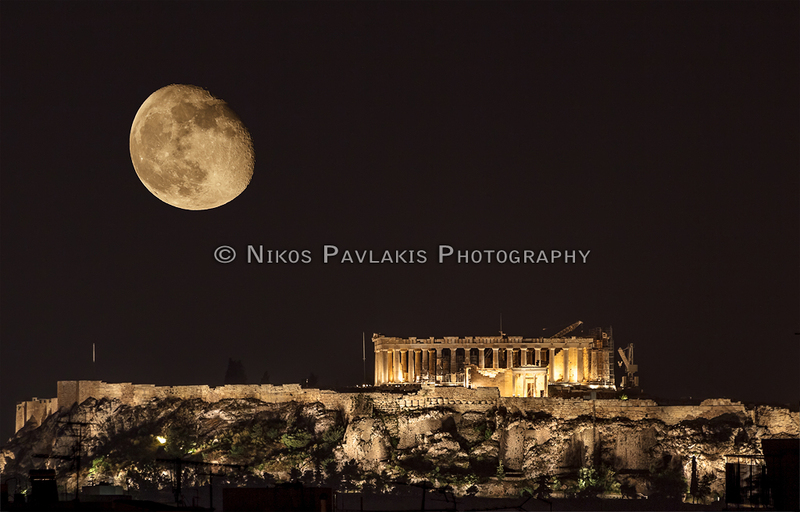 What I wanted was to align the moon with the view of Acropolis of Athens and then determine when the time was right to photograph both of them in a single frame (if a proper exposure could be maintained or adjusted). I also wanted the moon to be a little bigger that half, but not a full moon, as this usually produces a flat shot. I found out that the moon was rising at 23:14 that day and I knew I had to give it some time to rise a little (around 20-30 minutes). But when I tried to align the moon with the Parthenon from my house on the map it was clear that it would never be aligned as the Parthenon is located significantly to the right of the moon. I discovered which the proper location for the alignment was, but I would have to wait for a month and recalculate the time (which could not suit me to say the least!). The place also changes as the days pass and you have to find the exact moment (10 minute period) that the moon rises above and near the Parthenon. I got very disappointed! I had to calculate everything for the perfect shot and even then it could be raining, or I might be at work, or sleep, or…phew! I quickly grabbed my Canon 60D, my Sigma 70-300 and my old tripod and headed for the roof. I tried not to think all the calculations I previously came across, but I wanted to see for myself how big the moon was and where would it come from in the sky with regard to Parthenon. When I opened the door everything became clear. The moon would never align with the Parthenon even if I went from one side of the roof to the other. 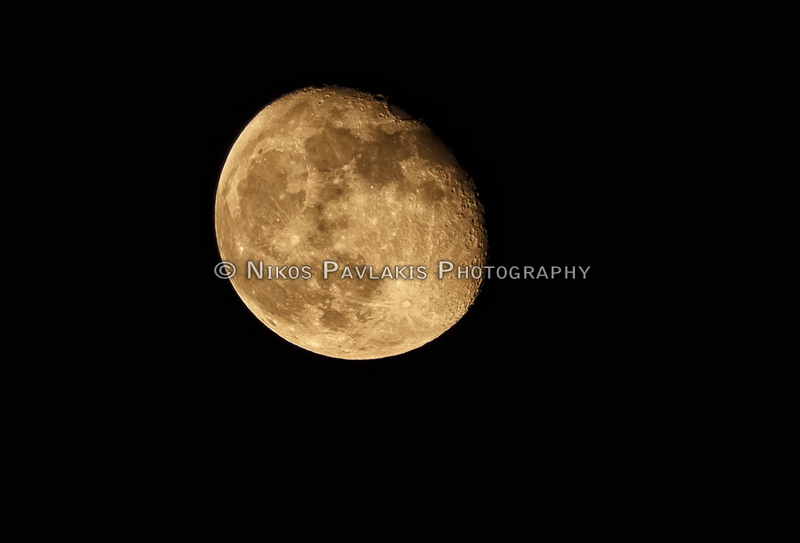 The time was around 00:20 and I decided to “cheat” for all of the above reasons, so I first shot the moon after securing my camera on the tripod which of course looked white as the moon had climbed a lot in the sky. 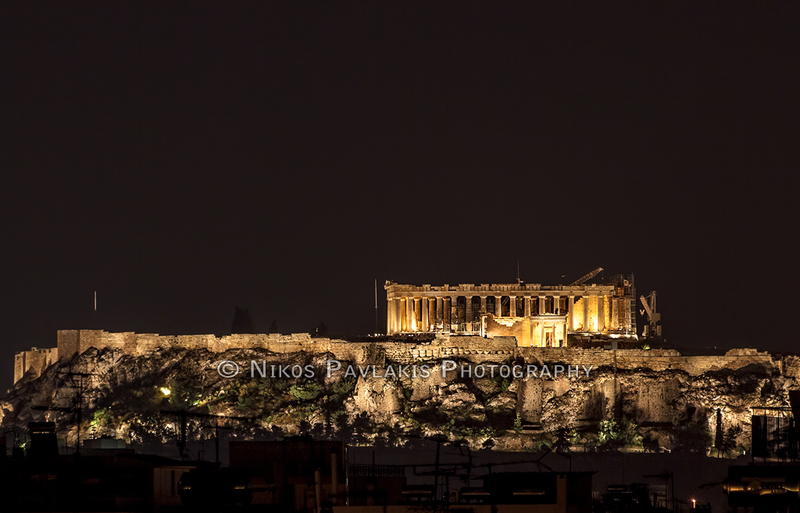 And then I shot the Parthenon in the same (or near) focal length as the moon (around 300mm@f8). I took some other shots as well to determine the level of noise a setting of ISO 1600 would produce and found out I could handhold the camera while shooting the moon at a speed of 1/800! I was impressed, but had to see the quality on my LED monitor to be convinced. And I was impressed to say the least. I mean, ok it had some noise, but it was almost the same amount my old 12 Mpixel camera would produce at ISO 200! This gave me much confidence and imagined myself holding a Canon 5D MK IV (future dream!) or a Nikon D800 shooting everything handheld! Then I woke up thinking of how much I should spend and landed where I was 2 minutes ago with my 60D in my hands. Comparison between the two shots. ISO 100 vs ISO 1600 or Tripod vs handheld. 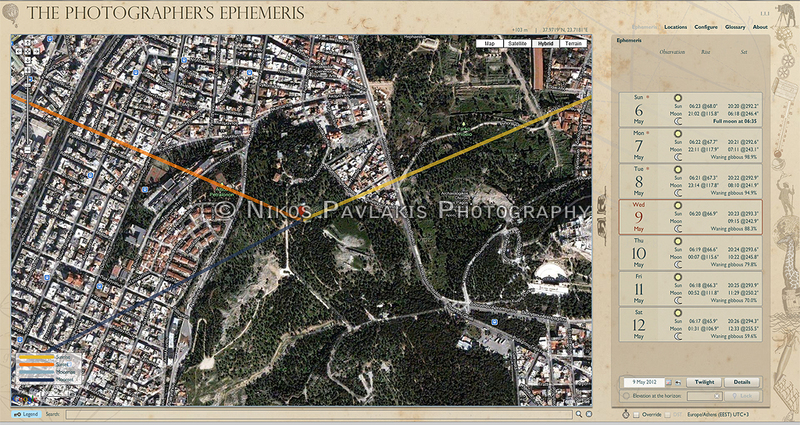 The photographer’s Ephemeris is a very useful tool to use, but it has some limitations because of the way it was built. In desktop computers there’s no GPS to calculate automatically your location, but that’s easily fixed by manual selecting and saving your favorite locations. The mobile version needs internet to show you the map and position where you are located and there’s no option to “save the location and map in your device for later use”. You can always calculate the moonrise/moonset, sunrise/sunset and twilights, but it doesn’t feel the same when you are “out in the wild”, without internet connection and you have to set everything right for the big moment. Nevertheless, I was happy with my few shots and my friends and colleagues showed good interest on the results and how I accomplished them. The whole procedure took around 5 minutes to complete in Photoshop and the Post Processing I did was very light (meaning only exposure, color profile and sharpness). Using so little time and work to get the results I wanted, I quickly forgot all about planning my shots and calculating the proper time, place and weather since it needed much fuss. But I felt like I was cheating and I cannot take it back or hide the truth when they first admire the shot. I then see the expression on their faces and the “WOW” becomes “Ah, so that’s what you did!” with a tad of disappointment that makes me wish I’d put into use all the calculations I had made before.